If you are into Neon Yellow, these luggage tags are exactly what you have been looking for. You can find several different varieties to fit any need that you might have. 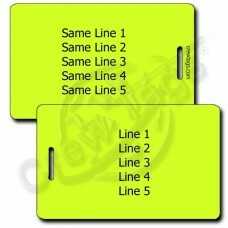 All of these Neon Yellow Plastic Luggage Tags are printed with your own personal information directly on the tag. They are simply the easiest, fastest and best way to spot your bag wherever life's journey might take you.